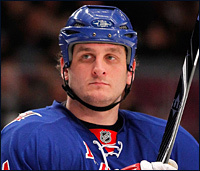 Jim Cerny, who covers the Rangers for newyorkrangers.com and the new Blueshirts United site, got to know Derek Boogaard in his capacity as a reporter over the past season and was in the press box for all 22 of Boogaard's games with the Blueshirts. Cerny shares some of his own and others' off-ice memories of Boogaard here. Although the voice on the other end of the telephone belonged to someone nearly half a world away, the pain in that voice still resonated as clearly as if that person were standing right next to me. “This is just devastating news,” Rangers’ forward Marian Gaborik said from his native Slovakia. Gaborik, of course, was speaking of the sudden shocking death of his longtime friend, and teammate with two different organizations, Derek Boogaard on Friday night. There were several things that stood out to me when I spoke with Derek’s Rangers teammates on the day after his untimely passing, but none moreso than the flat tones in which their words were spoken. It was as if Derek’s death had zapped the life from his friends and teammates, as well. It also struck me that no one I spoke with who knew Derek well mentioned his on-ice play first. Everyone chose to speak about what a kind, loyal, decent man he was -- “a gentle giant” according to Brandon Prust, his road roommate with the Rangers this past season. To those who did not know Derek past his fearsome on-ice reputation -- one buoyed by his 6-foot-7, 270 pound-plus frame and willingness to fight all of the top heavyweights in the NHL -- it might come as a surprise that he was such a soft-spoken, non-threatening person. He was a man with a quick smile who loved a good laugh. 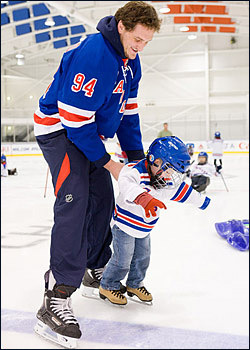 Derek Boogaard spends time with a youngster during a skating party for guests from the NYU Medical Center and the Starlight Children’s Foundation last November at the MSG Training Center. The children, many of whom were confined to wheelchairs, spent an afternoon with players. Exactly, Brandon. Derek gave me that smirk from the side of his mouth which was actually his full-on smile. And yes, there was that low rumble that came from deep within that came out in an infectious laugh that made his other card-playing buddies on the plane look up and want to know what was so funny. That’s the Derek I remember -- laughing, sharing in the camaraderie of his mates. 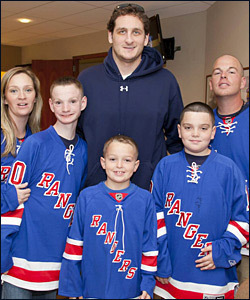 And it is the kind of memory his buddies on the Rangers were quick to share, as well. One of the more sad sidebars to Derek’s passing last Friday is the fact that he was unable to accomplish his goal of returning to the ice as protector of his Rangers’ teammates. It is a role he took great pride and responsibility in -- one that ultimately led to 589 penalty minutes in 277 career National Hockey League matches. Derek missed the final 52 games of the 2010-11 season after suffering a concussion in Ottawa on Dec. 9. Teammates who spoke with him in recent weeks say that Derek was driven to get himself healthy and fit for September’s training camp, so that he could return to his enforcer’s role with the Blueshirts. To see the outpouring of love for Derek these past few days has been heartwarming and comforting at a time when there is little comfort in the passing of a 28 year-old man seemingly in the prime of his career and life. There was a memorial for Derek put together by fans of the Wild outside Minnesota’s Xcel Energy Center on Sunday, and remembrances in New York of a man who consistently showed his charitable side, be it with his work with The Garden of Dreams Foundation or with his own Defending the Blue Line endeavor. And there were platitudes arriving throughout the world of social media, including poignant heartfelt comments from one of his true on-ice rivals, the rugged Georges Laraque. In the end, those of us lucky to have known Derek, even a little bit or for a short time, are left with some very on-the-mark words from one who knew him well.